TERRA project teams will integrate the agriculture, information technology, and engineering communities to design and apply new tools to the development of improved varieties of energy sorghum, a crop used to produce biofuel. Producing the large amounts of biomass needed for biofuels to displace petroleum requires significant improvements to the productivity and efficiency of biofuel crops. The teams will enhance methods for crop phenotyping (identifying and measuring the physical characteristics of plants), which are currently time-intensive and imprecise. The new approaches will include automated methods for observing and recording characteristics of plants and advanced algorithms for analyzing data and predicting plant growth potential. These innovations will accelerate the annual yield gains of traditional plant breeding and support the discovery of new crop traits that improve water productivity and nutrient use efficiency. Clemson University is partnering with Carnegie Mellon University (CMU), the Donald Danforth Plant Science Center, and Near Earth Autonomy to develop and operate an advanced plant phenotyping system, incorporating modeling and rapid prediction of plant performance to drive improved yield and compositional gains for energy sorghum. The team will plant and phenotype one of the largest sets of plant types in the TERRA program. Researchers will design and build two phenotyping platforms - an aerial sensor platform and a ground-based platform. The aerial platform, developed by Near Earth Autonomy, is a fast moving, autonomous helicopter outfitted with sensors that will collect image data from above. The ground platforms are customized robots from CMU that will drive between crop rows below the plant canopy and collect data using two distinct sensor suites. The first will use sophisticated cameras and imaging algorithms to develop detailed 3D models of individual plants and their canopy structure. The second will have the unique ability to directly contact the plant in order to systematically measure physical characteristics that were previously measured manually with labor-intensive, low-throughput methods. The team will use machine learning techniques to analyze the data gathered from the phenotyping systems and translate this into predictive algorithms for accelerated breeding of improved biofuel plants. If successful, Clemson's initiative will deliver commercially viable automated crop sensing platforms, advanced methods and datasets for rapidly breeding improved plant hybrids, and improved, high-yielding hybrids of biofuel crops. Increased use of biofuels could significantly reduce CO2 emissions from transportation, and improved varieties of biofuel crops could use less water and be more resistant to environmental stresses. Advanced crop breeding techniques could improve and lower the cost of developing high yielding and high quality crop hybrids for biofuels and other agricultural applications. The Clemson team has taken a “system of systems” approach to accelerate genetic gain in biomass sorghum. The team’s goal is to create sorghum varieties that are adaptable to the environment and soils of the American Southeast. The team built three sensor packages on autonomous ground rovers and unmanned aerial vehicles (UAVs). 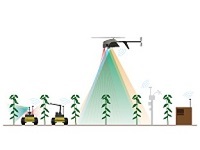 Two of the platforms use visual, thermal, and light detection and ranging (LiDAR) sensors to evaluate plant structure. A third platform uses a robotic arm to grab plant stems and evaluate physiological or compositional traits. The team also developed learning and predictive algorithms to predict end-of-season harvest attributes. The final step is to identify causal genes for optimal traits and then design crossing strategies to produce high-yielding plants that are well-suited to their environment. Clemson has partnered with several companies to bring different aspects of its project to market. Carolina Seed Systems, a genetics company, will produce sorghum and other crop seed specifically bred for the conditions of the Southeast. TERRA-SCAN is a start-up that provides phenotyping and field scouting services for crops, including sorghum. Finally, Near Earth Autonomy will market an agricultural data collection product derived from the team’s aerial platform. For a detailed assessment of the Clemson project and impact, please click here.